TWO influential Asian women inspired members of the Woking Asian Business Forum (WABF) with tales of their lives on the evening of February 9, 2009. 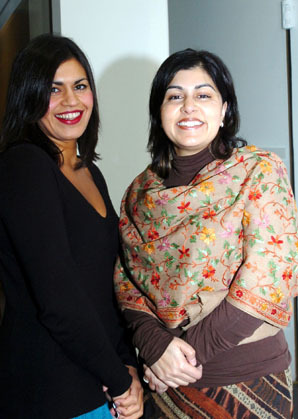 Away from the doom and gloom that many businesses are experiencing in the current economic climate, Baroness Sayeeda Warsi, shadow minister for community cohesion and social action, and Tamara Abood, commissioning editor for the Channel Four television channel, provided laughter and encouragement for members of WABF. Both women followed the careers their parents expected them to, but they spoke about the importance of being strong and successful Asian women in the world of business. They have both been practising solicitors, then went on to change their career paths and their outlook on life. WABF chairman Shahid Azeem said the forum was working with its members to help them move into mainstream business sectors and said he was thrilled to see so many women at the meeting. Baroness Warsi spoke about her rise into the world of politics. She left a successful law practice behind, along with a comfortable six figure salary, to work in ‘women’s empowerment’ in Pakistan. The terrorist events of September 11 had a profound effect on her and she saw herself as an Asian woman but even more as a Muslim. She was the Conservative Party candidate for Dewsbury, Yorkshire, in the 2005 general election but failed to win the seat. Baroness Warsi described the moment she left the town hall there in the early hours after the announcement of the poll result. She went on to become the youngest member of the House of Lords, hitting the headlines in December 2007. That was when she helped to free teacher Gillian Gibbons from a Sudanese jail in the row over naming a class teddy bear Mohammed. Speaking after the meeting, Baroness Warsi told the News and Mail she is halfway through writing two books, one of which is an Asian woman’s take on the bestseller Bridget Jones’s Diary. Miss Abood spoke of how she met Mr Azeem when he was one of a team on Millionaires’ Mission, a programme she was producing for Channel Four. She said it had been difficult to find candidates from an ethnic background to participate and help meet Channel Four’s commitment to diversity. The programme used the success of the entrepreneurs involved to help tackle poverty in Uganda. Her role as commissioning editor involves her deciding what kinds of programmes should be on Channel Four. She spoke about the influence of television in today’s world and how many people’s opinions are formed by the work of journalists and programme-makers, business people and politicians. The meeting at The Lightbox also featured a talk by Emma Cartwright, from Woking Hospice, about the forthcoming Keeping the Doors Open campaign, to raise cash for the hospices in Woking and Weybridge.